Princie, one of the largest pink diamonds in the world, has been sold at Christie’s auction in New York for more than $39.3 million. The Princie Diamond was purchased by an anonymous collector bidding by phone, Christie’s said. The 34.65 carat diamond’s origin can be traced back to the ancient diamond mines of Golconda in southern India. The Princie Diamond once belonged to the royal family of Hyderabad, rulers of one of the wealthiest provinces of Mughal India. “The Princie Diamond carries a fabulous provenance, which brings together the legendary names of Golconda, [the] Nizam of Hyderabad, and the Maharani Sita Devi of Baroda,” said Christie’s jewellery department head Rahul Kadakia before the sale. “The most beautiful stones discovered in Golconda were always reserved for kings and rulers as they represented the highest power, which was then magically transferred to the owner. The Princie Diamond was once owned by the Nizam of Hyderabad, who was proclaimed the richest man in the world by Time magazine in 1937. The diamond had not seen in public since 1960 when Sotheby’s sold it as the “property of a gentleman”. All four of the world’s top pink diamonds have been found at Golconda, Christie’s says. The area has the earliest known diamond mines in the world, producing the stones as early as 800BC. In 2010 a diamond known as the Graff pink was sold in Geneva by Sotheby’s for $44 million. At the time it was believed to be the most expensive gemstone bought at auction in history. The two largest pink diamonds – the Darya-I Nur, weighing 175 to 195 carats, and the Nur ul-Ain, weighing about 60 carats – originally formed part of the Iranian Crown Jewels. Experts say it has since been determined that they were cut from a single pink diamond weighing 242 carats. 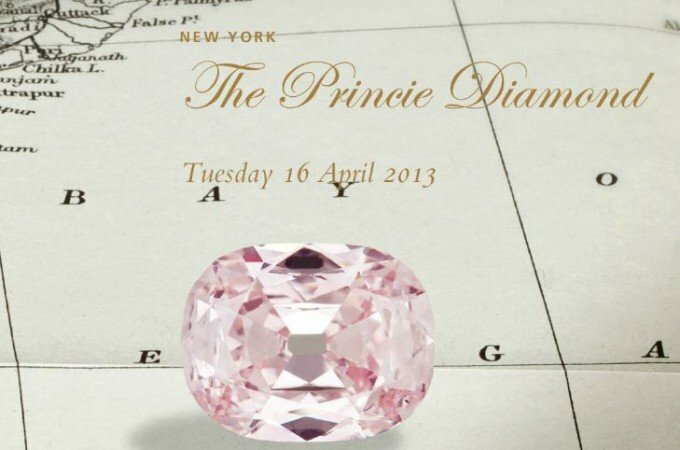 Christie’s says that the Princie Diamond is believed to be the third largest pink diamond in the world and was found 300 years ago in the Golconda mines.